Every gentleman with class should have a library. A home without books is like a person without a soul. Sonia Delaunay's wonderfully illustrated poem, La Prose du Transsibérien et de la petite Jehanne de France, by Swiss-French poet Blaise Cendrars is one of the highlights of 20th century literature and modern art. In this wonderful publication, the observer is entranced by Sonia Delaunay's extraordinary effects of lush, vibrant colors and bold shapes. Bright watercolors seem to come alive on the page in an almost three-dimensional experience. La Prose du Transsibérien et de la petite Jehanne de France was published by Editions Des Hommes Noveaux in Paris, 1913. Only 150 pieces were published, all of them individually numbered. Sonia Delaunay used the by now lost art of the "pochoir" as a medium; a pochoir is perhaps the finest of all printing processes. Each pochoir was hand colored by master artisans, a precise craft that is no longer used due to the amount of work that is required. Pochoir is the French word for stenciling, a form of coloring pictures that dates to a thousand years ago in China. It was introduced to commercial publishing in France in the late 1800s, and there it had its most exquisite expression. The pochoir process would use from 20 to 250 different stencils applied to a black-and-white collotype print from a photograph. The collotypes are affixed to stencil sheets of metal or board, and the patches to be colored are cut out. Each color to be applied uses a separate pompon, or brush of coarse, shortly-cropped animal hair, to sponge or dab on the paint. Each stencil is done in turn until the image is finished, so it is essential to place the stencils exactly in position. Brilliant swirls of color cascade down the left side of this elongated composition, ending with a simplified representation of a red Eiffel Tower. Juxtaposed on the right, in a parallel arrangement, are the words of the poet Cendrars, which end with the text "O Paris". Colors and words drift in a nonlinear fashion similar to a stream of consciousness, a state in which time and location are irrelevant. 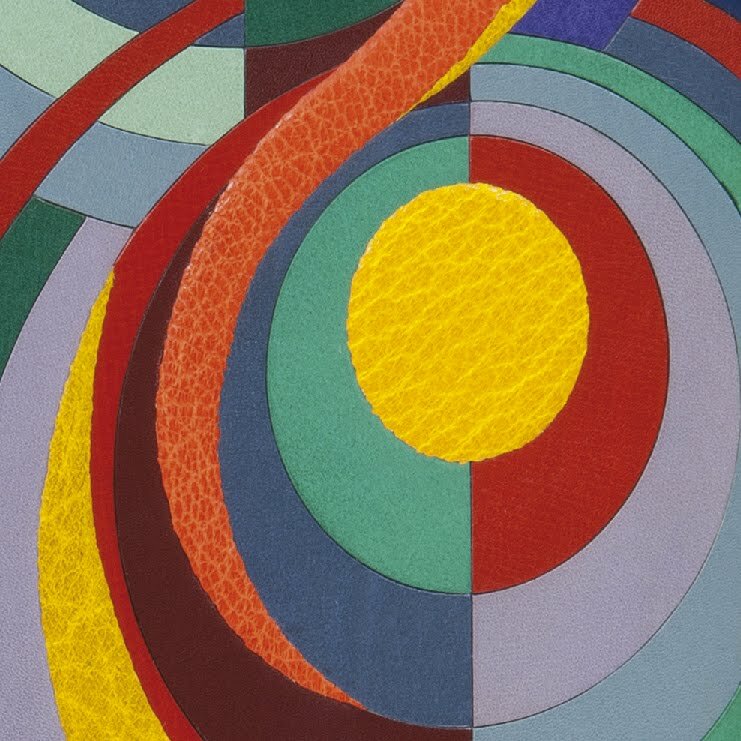 Sonia Delaunay's hues and Cendrars's prose interact on a simultaneous journey, producing synchronized rhythms of art and poetry. The text of La Prose du Transsibérien et de la petite Jehanne de France (Prose of the Trans-Siberian and of the Little Jeanne of France) contains Blaise Cendrars's sporadic flashbacks and flashforwards to other times and places, and recounts his railroad journey from Moscow to the Sea of Japan in 1904. It also includes recollections of a train ride with his young French mistress, the "petite Jehanne" of the title, who repeatedly asked, "Are we very far from Montmartre?" Calling their creation "the first simultaneous book," Sonia Delaunay and Blaise Cendrars drew on the artistic theory of simultaneity, espoused by the artist's husband, the painter Robert Delaunay, and modern poets.